RFP sequence, based on E1010, with the number of oxidation-prone sites reduced to the minimum possible amount. To generate this RFP variant with enhanced mutation resistance, we made synonymous codon substitutions to the commonly used E1010 RFP sequence in the registry. These sequence modifications were preformed by a computer algorithm developed by the Vanderbilt 2015 team. The algorithm removed sites that, upon exposure to oxidizing agents, form oxidized bases at an elevated rate (Senthilkumar et al 2003). In particular, this optimization lowers the frequency of 8-oxoguanine mutations, which is the most common form of DNA base oxidation. 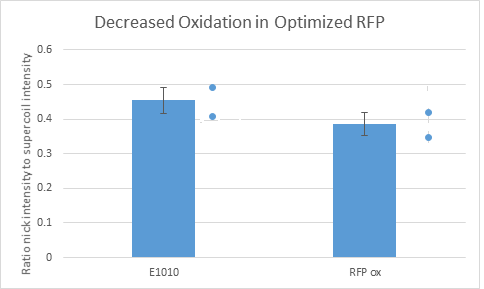 Overall, our optimization algorithm was able to reduce the number of oxidation-prone sites by 54% relative to the original E1010 sequence. 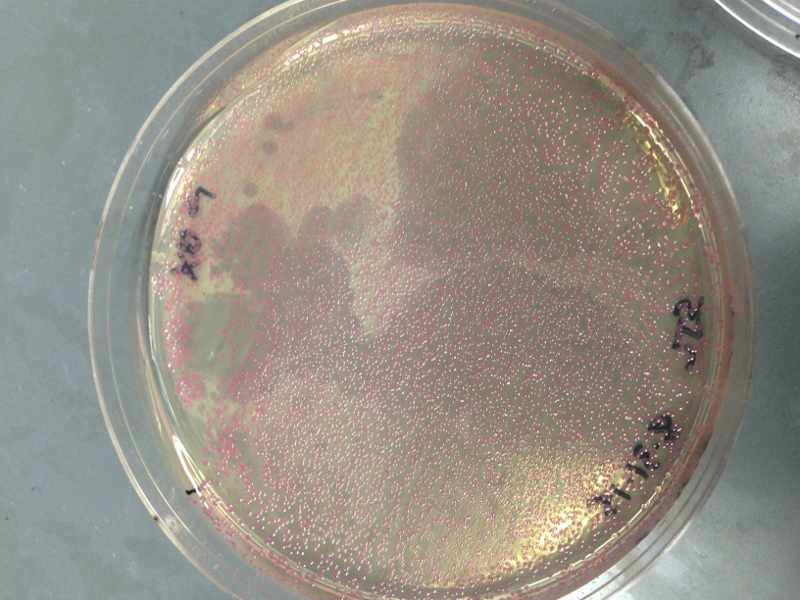 We used gel electrophoresis following incubation of oxidized DNA with the enzyme FPG to quantify the amount of mutagenic lesions in our DNA sequences. The results shown below demonstrate a trending, but not statistically significant, decrease in the formation of oxidized DNA bases in the K1673104 sequence relative to the original E1010 sequence. We first check for the successful integration of our synthesized sequence for K1673104 first by restriction digest. A band was produced at roughly 2.8 kb, as expected for the sequence in pSB1C3. We then sequenced the gene from the forward and reverse ends using VF2 and VR primers. Although the reverse primer sequence was low quality, forward sequencing conclusively determined that our optimized sequence was present and in the correct orientation. During the algorithmic optimization process, codon-usage frequencies were factored in to which nucleotide substitutions to make, When placed under the R0010 IPTG-inducble promoter, our cells visibly fluoresced red. To check that our mutation-optimization procedure did not disrupt expression compared to the codon-optimized sequence, we measured fluorescence intensity at 645 nm with multiple replicates. Fluorescence intensity was similar to K1673101, or approximately 50% as intensity as E1010 RFP under the same promoter.